The Wisconsin Department of Transportation (WisDOT) announced the designation of the state’s fifth scenic byway on August 27, 2017. The Nicolet-Wolf River Scenic Byway is a 145-mile route traversing parts of the state’s north-central counties of Forest, Langlade, Oneida and Vilas. This scenic byway is named in honor of two of its nationally-recognized resources: the Chequamegon-Nicolet National Forest and the Wolf River, a National Scenic River. A variety of recreational opportunities are available to travelers ranging from activities on the extensive multi-use trail systems to water-based sports. "This newest scenic byway is the result of individuals, local governments and organizations coming together to have a positive economic impact on their communities,” said WisDOT Secretary Dave Ross, who officially designated the scenic byway. "Their efforts will provide travelers with a genuine Northwoods experience." 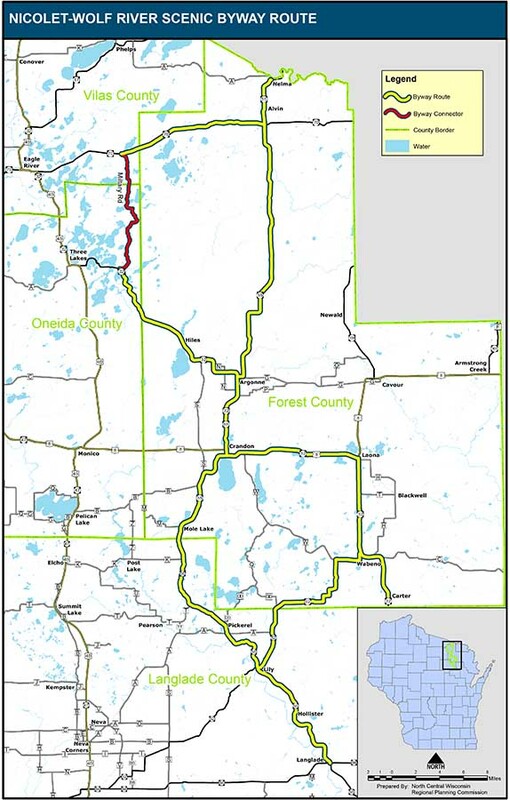 The route winds through the Chequamegon-Nicolet National Forest and various communities, including: Langlade, Hollister, Lily, Pickerel, Mole Lake, Crandon, Argonne, Alvin, Nelma, Hiles, Carter, Wabeno and Laona, as well as the Sokaogon Chippewa and the Forest County Potawatomi communities. The Forest County Potawatomi Community Cultural Center and Museum near Crandon provide visitors an opportunity to explore Tribal culture and heritage. The region’s logging heritage comes alive at the Lumberjack Steam Train and Camp 5 Museum complex in Laona, and the Wabeno Logging Museum. Wisconsin’s Scenic Byways Program is a cooperative effort between local communities and WisDOT to identify, promote and enhance some of the most scenic and historic state highway corridors. Visit the WisDOT Wisconsin's Byways website for more information.